Samsung, the leading technology giant is all set to unveil new range of Galaxy A-Series phones at an event in Milan, Sao Paulo and Bangkok. We have already seen several phones from Samsung under the Galaxy A series such as Galaxy A10, Galaxy A20, Galaxy A30 & Galaxy A50 for the Indian market. 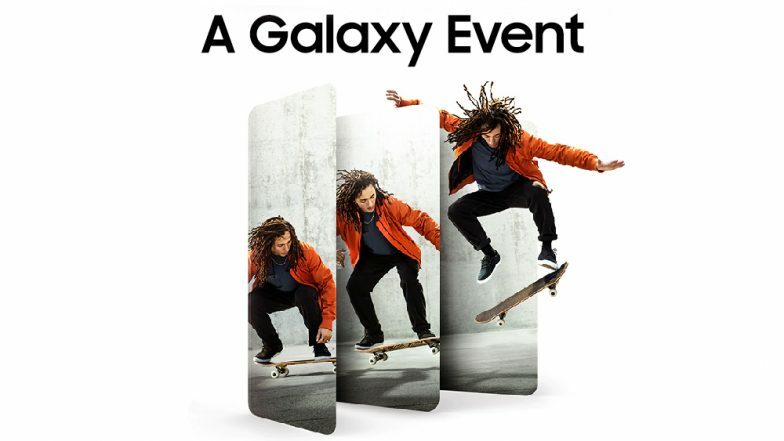 As Galaxy A40 and Galaxy A70 phones have been revealed for several other regions, we can expect the phones to make their global debut at today's event. It is also believed that the Korean phone maker could also introduce Galaxy 90 aka Galaxy A90 smartphone as well. However, there is no official confirmation about the same. Samsung Galaxy S10 Flagship Smartphone Easily Fooled By User's 3D Printed Fingerprint; Watch Video. The 'A Galaxy Event' will be live streamed on Samsung's dedicated website from Bangkok, Milan and Sao Paulo. The Bangkok event is scheduled to start from 5:30PM IST onwards. Moreover, the company has also announced that Galaxy A Series phones will be its budget smartphones that replaces the Galaxy J Series. Samsung Galaxy A90 Key Specifications Leaked Online Via Concept Video; To Get 48MP Pop-up Rotating Camera. Launched last month at EUR 249 (around Rs. 19,500), the Samsung Galaxy A40 gets a 5.9-inch full-HD+ (1080x2280 pixels) Super AMOLED Infinity-U display, Android 9.0 Pie with One UI, Samsung Exynos 7885 SoC, 4GB of RAM, 64GB of interal memory, a dual rear cameras, 25MP selfie camera, a fingerprint sensor, 3100mAh battery and much more. On the other hand, Galaxy A70 was also unveiled late last month however, the prices are still under wrap. It comes with a 6.7-inch FHD+ Super AMOLED Infinity-U display, Android 9.0 Pie with One UI, an octa-core processor, up to 8GB of RAM and up to 128GB of internal space, triple rear cameras (32MP + 8MP + 5MP), a 32MP selfie camera, an in-display fingerprint sensor, and 4500mAh battery with 25W fast charging support and much more. Samsung Galaxy A20 With Super AMOLED Display Now Available For Sale in India; Price, Specifications, Features. We have seen several rumours in the past regarding the Galaxy A80 and Galaxy A90. The new rumours hint that Galaxy A90 will be launched as Galaxy A80. If the market reports are to be believed, the Galaxy A80 will feature rotating slider camera which can be rotated for taking selfies. The phone is expected to sport a 6.73-inch FHD+ display with a 1080x2400 pixels resolution. Under the skin, there could be a Snapdragon 7150 SoC for carrying out heavy tasks easily. For photography, the phone will get dual rear camera comprising of 48MP primary camera with an 8MP secondary lens. The phone will also be backed by a 3,700mAh battery with 25W fast charging support. More details will be revealed at the launch event.